There are well over a thousand trees here at BBG. Some are so distinctive that they’re almost famous—the weeping beech near Oak Circle, for instance, and the hybrid oak at the base of Daffodil Hill. But there are also plenty of hidden gems that deserve to be called out for their resilience and beauty. In some cases, the Garden acquired a rare or unusual tree and placed it in a secluded spot to observe over time in case it couldn’t grow in our climate and soil. Experimenting with plants is one of the most exciting parts of working at a botanic garden, after all. Many of these trees are still growing today. Other specimens may have predated the Garden, and some have just gotten lost in the shuffle. 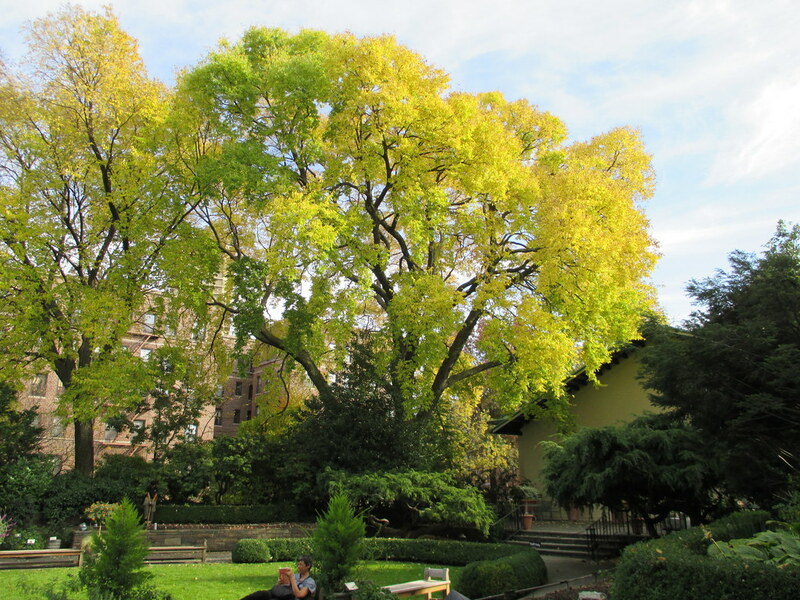 Here are a few of my favorite lesser-known trees at BBG. This is one of the oldest trees at BBG—it was planted in 1915. Stand back on the lawn and look at it from a distance to appreciate its elegant form. The multiple trunks form an almost perfect vase shape. It’s spectacular year-round, but it’s especially so in the fall because of its foliage. The color progresses in bands from yellow to orange, then to pink and red. Since the leaves are heart shaped, this creates a rainbow of hearts in autumn. 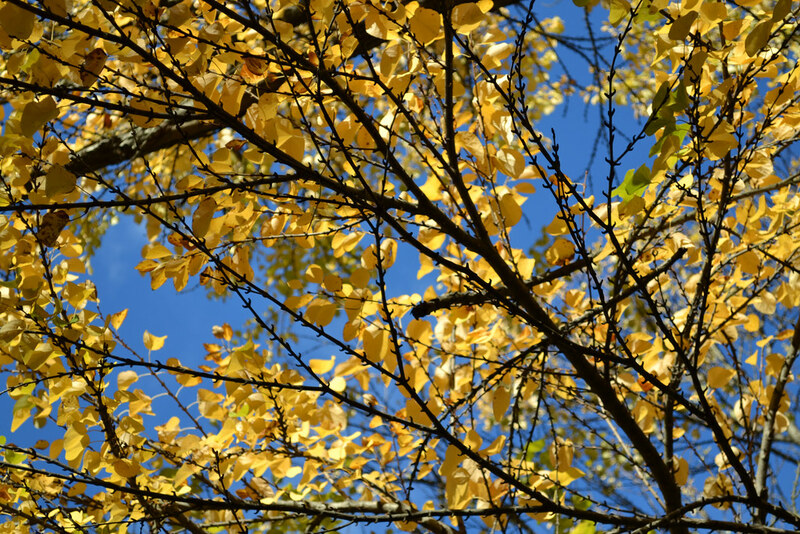 The leaves also have a really pleasant, sweet fragrance in the fall, like brown sugar or cotton candy. 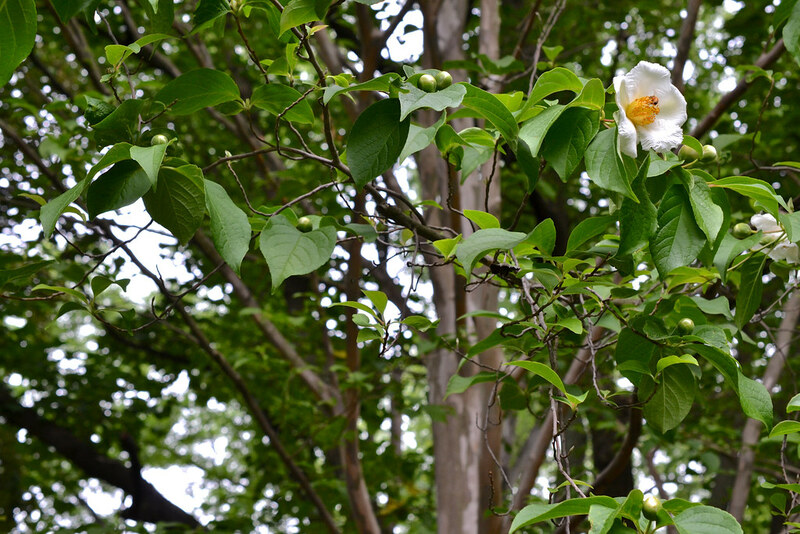 This native species is actually considered a weed tree by many gardeners. It can grow in really harsh environments, and you might find one growing out of a crack in the concrete. But this mature specimen proves what an amazing tree it can become, given the chance to thrive in the right place. Our records don’t tell us exactly when this one was planted, but it’s probably about 100 years old and very likely a volunteer tree—the classic ugly duckling that grew into a swan. It has a beautiful canopy that shades BBG’s Administration Building in spring and summer, a nice yellow fall color, and really interesting grayish, gnarly bark. Sourwoods are not native quite this far north, but this one is thriving here. It’s a member of the same family as azaleas and rhododendrons (Ericaceae) and produces pretty white flowers in the summer that bees—and beekeepers—love. (Sourwood honey is thought to be one of the best-tasting, sweetest honeys.) Its leaves turn a brilliant red in the fall, and the seedpods hang from the ends of the branches like fingers waving at you. In the South, it’s sometimes called dead man’s finger tree. The seedpods persist after the leaves drop, which appropriately enough tends to happen right around Halloween, though as temperatures have been warming, the leaves tend to stay on into early November. This particular tree suffered some broken limbs during Hurricane Sandy, but it’s recovering nicely. This gorgeous conifer is tucked away near the back gate that leads in from the Cherry Cultivar area of the Garden. One of the nicest perspectives for seeing it is from the path just across the pond. Look for a 40-foot-tall, straight-trunked, pyramid-shaped tree with blue-tinted foliage. As you walk along the path toward it, you’ll notice its smooth, reddish bark and a really nice fragrance coming from the older needles that have dropped to the ground. They smell kind of like cedar. This is also a great tree for birds to nest in—the sharp needles keep predators out. Cardinals, robins, and other year-round residents often take advantage of this feature. Walk along the path just above the stone wall on the east side of the Osborne Garden to see this beautiful small tree. It has something interesting going on year-round. Stewartias are related to camellias, and in the summertime, they produce similar white flowers, which attract a lot of bumble bees. It also has fantastic fall color. The leaf color progresses at different rates, even on the same branch, so you’ll see yellow, orange, and red simultaneously. It also has a really distinctive trunk and branches with multicolored, exfoliating bark that has flakes of yellow and red with green cortex visible beneath. This specimen is the largest stewartia in the Garden, and it’s older than you might think. It was planted in 1969 but has only grown to 35 feet tall. It’s a pretty slow-growing species in general, which is one of the reasons it’s getting more popular with home gardeners. Keep an eye out and you’ll start to notice more of them around. I really appreciated your postings of the various and unusual trees and shrubs in the garden. I use to live within walking distance and my dad took me there on weekends. That is probably why I ended up studying horticulture and landscape design at Cornell (class of 1955). I enjoy relearning northern plants. I am still struggling with the ones here in Florida. Thank goodness I live in Zone 9 so I can grow azaleas. Keep up the good work. 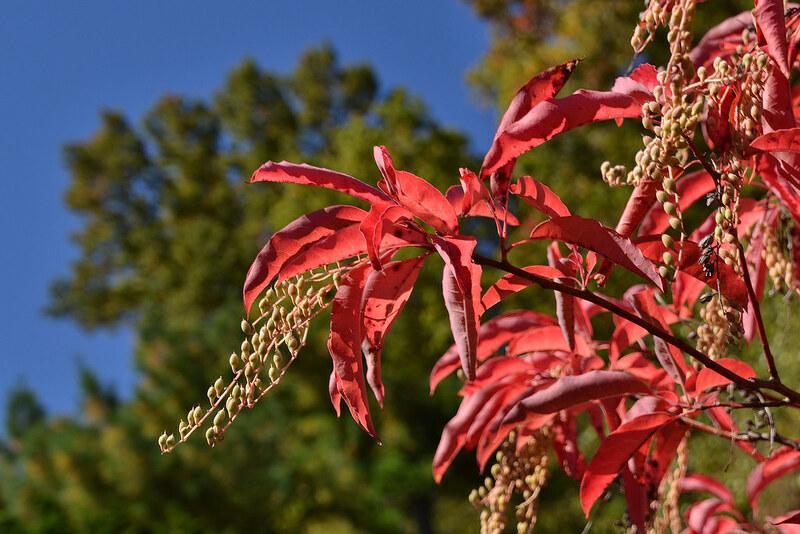 Oxydendrum arboreum (sourwood) showing its striking red fall colors, in the Osborne Garden. Photo by Lee Patrick. 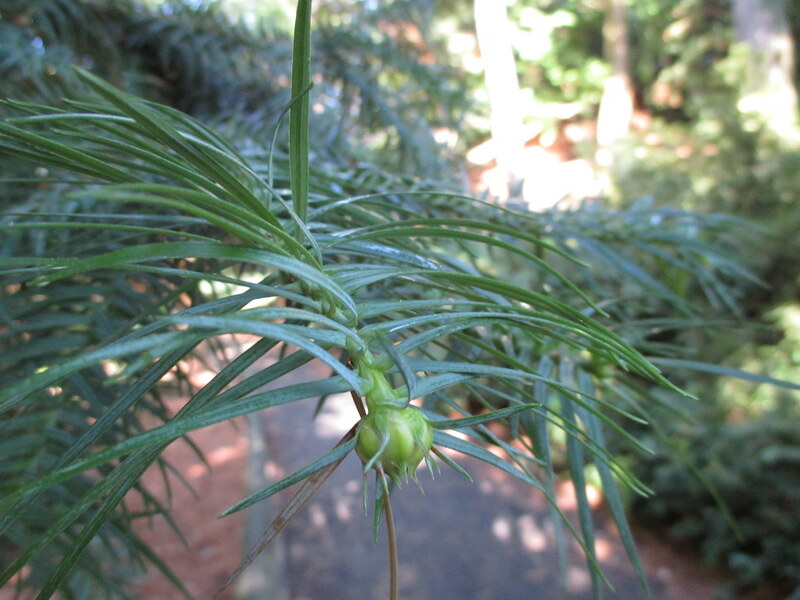 The sharp needles of the Cunninghamia lanceolata 'Glauca' (China fir) help protect the birds that nest in it. Photo by Sarah Schmidt. (Stewartia pseudocamellia) Japanese stewartia flowers in June in the Osborne Garden. Photo by Morrigan McCarthy. The foliage of the Cercidiphyllum japonicum (katsura) tree will change from yellow to orange to pink to red as autumn progresses. Photo by Elizabeth Peters. This beautiful Celtis occidentalis (hackberry) tree is probably about 100 years old and was likely a volunteer tree (one that self-seeded rather than being intentionally planted). Photo by Sarah Schmidt.